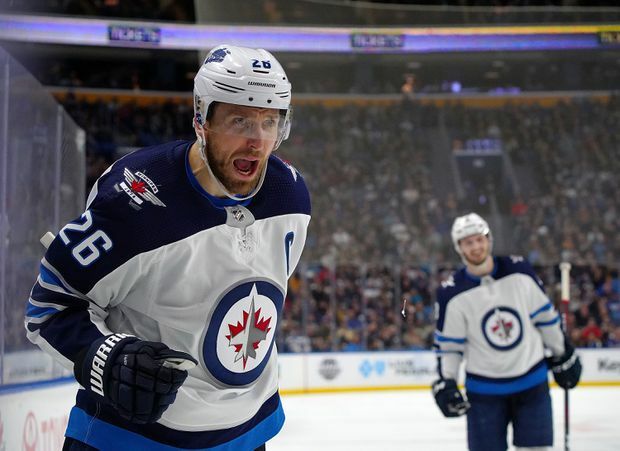 Blake Wheeler of the Winnipeg Jets celebrates after scoring the winning goal against the Buffalo Sabres during the third period at KeyBank Center on Feb. 10, 2019, in Buffalo, N.Y.
Blake Wheeler scored the go-ahead goal by redirecting Josh Morrissey’s centring pass with 3 minutes 55 seconds remaining and the Winnipeg Jets beat the Buffalo Sabres 3-1 on Sunday to snap an 0-2-1 skid. Connor Hellebuyck made 35 saves to help the Jets end their longest winless streak of the season and maintain the Central Division lead. At 35-18-3, Winnipeg earned its 73rd point to move two ahead of Nashville after the Predators’ 5-4 overtime loss to St. Louis earlier in the day. The Jets were coming off of consecutive 5-2 road losses against Ottawa on Saturday and Montreal in a game Thursday night in which the Canadiens outshot Winnipeg 53-34. Jets coach Paul Maurice joked before Sunday’s game the Jets could have allowed 15 goals given how poorly they played against Montreal. Copp opened the scoring 3:01 into the second period on a short-handed breakaway. He got loose up the left wing after Dahlin went to his knees and failed to keep a bouncing puck inside the blue line. Copp burst in and snapped a shot beating Hutton inside the far post. It included him stopping Adam Lowry on a short-handed breakaway. Hutton was losing his balance and put his glove down to balance himself just as Lowry tried to slip a shot through the goalie’s legs. The puck instead hit Hutton’s glove. Hutton recovered in time to stop Brandon Tanev attempt to convert the rebound.